RAW Video: World's 2nd largest, biggest known meteorite found in Argentina. Scientists have discovered a meteor weighing over 30 tonnes in northern Argentina. The meteorite was found in the town of Gancedo, 1,085 km north of capital Buenos Aires, Mario Vesconi, president of the Astronomy Association of Chaco, said on Monday. While we hoped for weights above what had been registered, we did not expect it to exceed 30 tons," Vesconi said, adding that "the size and weight surprised us", Xinhua news agency reported. "It was in Campo del Cielo, where a shower of metallic meteorites fell around 4,000 years ago," Vesconi added. The meteorite will be weighed again to ensure an accurate measurement. 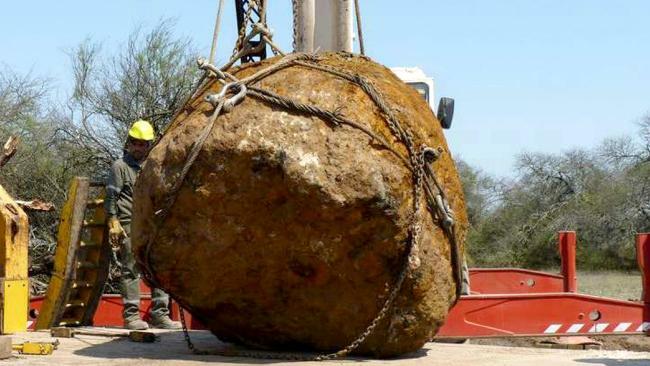 The largest meteorite ever found is called Hoba, weighing 66 tonnes in Namibia, Africa.